Moldova Philharmonic, a permanent concert activity institution, was inaugurated on 9 October 1942 in the National Theater Hall in Iasi, with a concert led by Master George Enescu. Between September 22-29, 1951, the Philharmonic hosts a Romanian Music Week. In the spring of 1953 there is an event that will open new and happy perspectives of artistic development: the establishment of the Choir under the leadership of the teacher, musicologist and conductor George Pascu. In the autumn of the same year he will get the title of Choir Gavriil Musicescu of the Iasi State Philharmonic. In 1962, the young conductor Ion Baciu arrives at the symphonic orchestra of the Philharmonic, which will turn this ensemble into a national and internationally short class. This is, after the creation of the Chorus, the second moment of crossroads in the life of the Philharmonic. The unmistakable string of the string orchestra, cultivated by Ion Baciu, will attract the musicalologist Iosif Sava the characterization that has become the emblematic of “Stradivarius of Baciu”. The orchestra had already become an ensemble of artistic personality, and in 1971 the first tour abroad took place in Germany. Stimulated by the artistic rise of the Philharmonic Orchestra, the first edition of the Romanian Music Week will be organized in 1973, which will later become the Romanian Music Festival. Also in 1973, the Orchestra of the Iasi Philharmonic is invited for the first time to participate in the George Enescu International Festival. Between 1984-1989, the lead of the Iasi Philharmonic is named violinist Bujor Prelipcean who managed to find funds and financially support the continuity of the Philharmonic. Despite all the impediments, the Iasi Philharmonic has become a remarkable and not once appreciated artistic presence on concert stages in the country – primarily Bucharest – and abroad: the Beethoven Hall in Bonn, the Ancient Theater in Macerata (Italy) Concertgebouw in Amsterdam, Meistersingersaal in Nurnberg, Edvard Grieg Hall in Bergen (Norway), Salle Gaveau in Paris, Auditorium in Madrid, Gewandhaus in Leipzig, Tonhalle in Zurich, Gasteig of the Munich Philharmonic … Also in New York, Chicago, San Francisco, Boston and Los Angeles times in Vancouver, Edmonton, Ottawa, Toronto, Montreal. Parallel to the scenic presence, the ensembles of the Iasi Philharmonic have recorded scores of hours of music, from different genres and periods, Romanian and foreign, on disc, on radio and on television. In 1986, conductor Ion Baciu left the Philharmonic Orchestra and Iasi, and was followed by Gheorghe Costin (1988-2001) at the orchestra’s desk for 13 years. Since 1990, the conductor and mentor of the Academic Choir Gavriil Musicescu of the Philharmonic has become Doru Morariu. 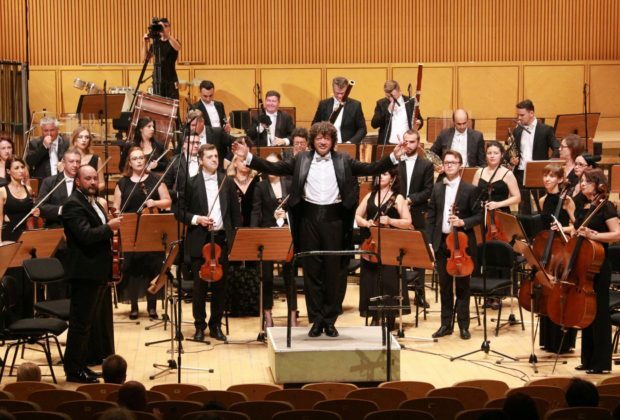 Between 1995-2001, alongside Gheorghe Costin, the young and talented Camil Marinescu activated at the stage of the Iasi opera orchestra; And from 1998 to 2009, a third was added to them – Alexandru Lăscae, a remarkable musician, master concert for over two decades at the Hague Symphony Orchestra (The Netherlands), also an experienced conductor. On February 17, 1999, violinist Bujor Prelipcean returns to the post of general manager of the Moldovan Philharmonic for the second time, having the longest directorate in the history of the institution. The Iasi Philharmonic awarded the title of Principal Guest Conductor to the well-respected orchestra conductors and also publishes remarkable musical personalities: Michele Santorsola (Italy) receives this title in 2003, Paul Nadler (USA) in 2004, Mark Mast (Germany) Petrescu in 2013. Since April 2008, the Ad libitum String Quartet has joined the artistic ensembles of the Moldovan Filamonics ensemble in Iasi.